It’s your turn to be the ROCKSTAR! Sing your favorite karaoke songs with a live band. Over 300 of your favorite karaoke songs to choose from. Playing the most popular songs of the last 50 years. Great for weddings, corporate events or any other public event needing fun entertainment. music or even upbeat entertainment. 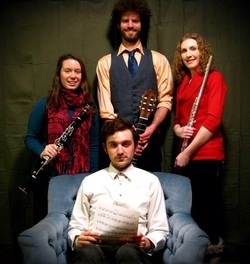 Tabula Nova Ensemble is a new music ensemble based in Milwaukee, WI. As a group of ambitious 20-something year old musicians, we've found each other through many different channels, but we all share one common goal. We are here to bridge the gap between the old and the new, to open the community up to any and all genres, and to empower ourselves and our audience in any way possible.